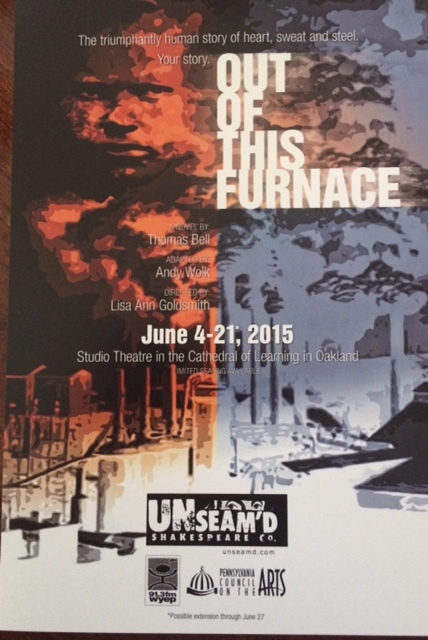 We are well into rehearsals now for Out of This Furnace. It’s a wonderful play based on the book by Thomas Bell and adapted by Thomas Wolk. We tell the story of immigrants who helped build this country and ultimately the unions that protected them. It was a different era from the 1890’s to the 1930’s America. It’s always a magical time from first read through to getting the play up in bare bones form to the sets that magically appear and the costumes that make the characters. It’s a really good cast, not surprisingly of professional actors with the Unseam’d Shakespeare Company. As the actors get their lines, the blocking sets our feet and everyday, something else is discovered about a character, a line reading a characters history. Ultimately as actors we are discovering ourselves, as the characters we portray have apparently always lurked within us and our director Lisa Ann Goldsmith has tapped each and every one of us to bring that character to life. It’s live theatre on an Actors Equity stage-and yes, it IS magic!